Brian is joined by the "Professor of Football" Zach Metkler and SCU contributor Ryan Lippert for the second mock draft podcast of the season. This time around the guys go totally insane and model the mock after one of Brian's "Mock Draft Insanity" profiles. * The Steelers trade Antonio Brown and their first round pick (number 20) to San Francisco for their 2nd overall pick and the Niners 3rd rounder this year AND a 2020 3rd. * The Steelers trade back from pick 2 with the Buffalo Bills for pick 9 in the first, pick 9 in the second, and pick 7 in the third, plus pick 11 in the fourth AND next year’s first rounder. * The Steelers then trade back from pick 9 with the Carolina Panthers for their first round pick (16), pick 16 in the fifth round, and 2020 second and third round choices. * Finally the Steelers trade back one more time, with the Seattle Seahawks for pick 21 and a future 2nd and 3rd round selection. 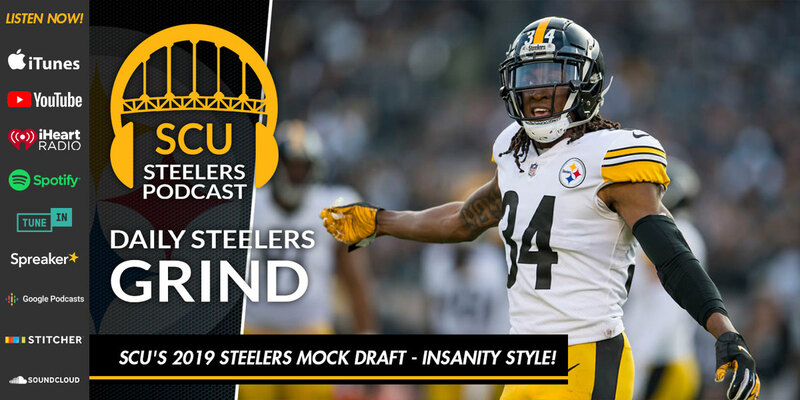 With that as the guide, the guys run through seven rounds of Steelers picks!